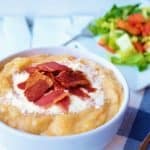 Creamy Potato Soup - Gluten Free + Fiber Filled! A delicious, creamy potato soup packed full of carrots, celery and russet potatoes, topped with a delicious flavor packed lean turkey bacon! In a large pot with a lid, boil water and add potatoes. Cook for about 25 to 30 minutes, or until fork tender. Drain water and set potatoes aside. To the bottom of the pot, add oil and saute onions for 2 to 3 minutes over medium heat. Add in garlic and celery, stir for a minute. Add in the vegetable broth and chopped carrots. Stir and cover over medium heat for 5 minutes. Add in the cooked potatoes, half and half and seasonings. Stir again and let sit over medium heat for an additional 10 minutes. Remove lid and using an immersion blender puree soup to desired consistency. Contents will be hot! Be careful not to burn yourself. Serve immediately and garnish with chopped bacon.